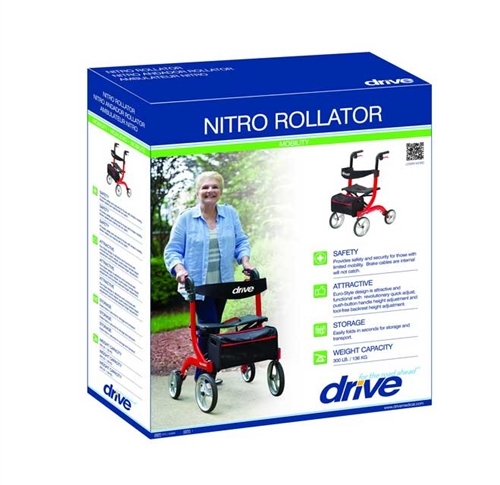 The Nitro Aluminum Rollator Hemi Height with 10 Inch Casters by Drive Medical is idea for users that are 5.2” and below. The handle height is easily adjusted with a unique push button designed to go from 28” up-to 31” in height. 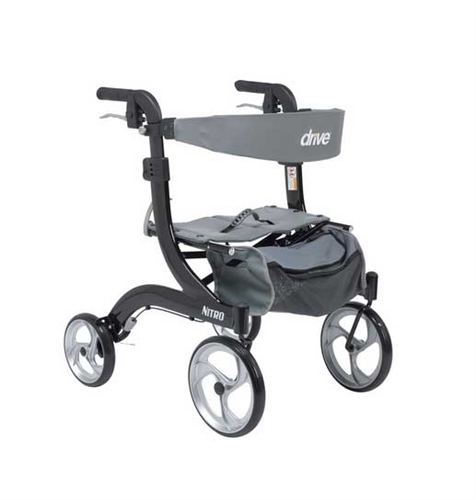 The attractive Euro-styled design includes a comfortable seat, backrest, and removable zippered storage bag with unique attachment to keep bag securely in place when the Nitro is open or folded. The brake levers provide easy braking for added security. 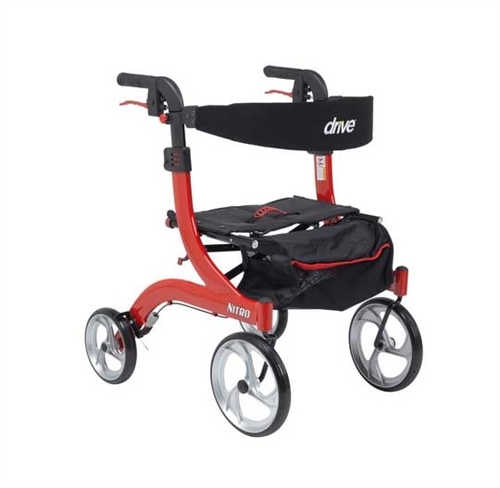 The brake cables run down through the inside of the frame providing a nice look, removing clutter and helping avoid catching cables on objects when the rollator is in use. The comfortable backrest adjusts with a tool-free thing screw. 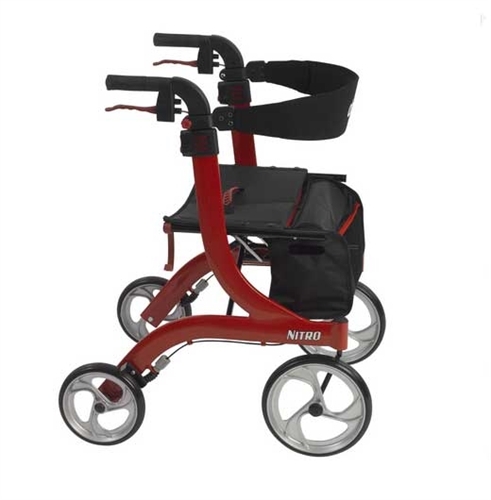 The caster fork design enhances the turning radius and the large 10” front casters allow optimal steering and rolling comfort. 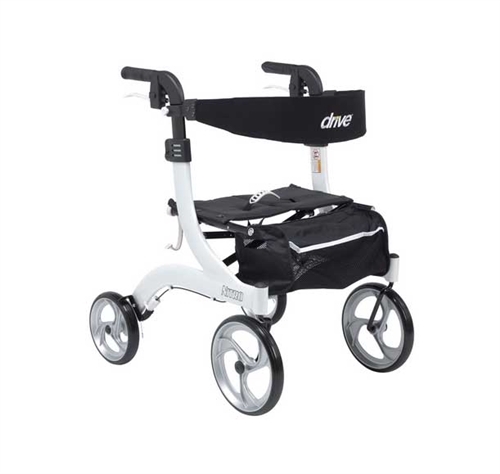 It easily folds with one hand to ulra compact size for storage or transport. It has a plastic clip that holds the Nitro Hemi Size when the frame is folded. 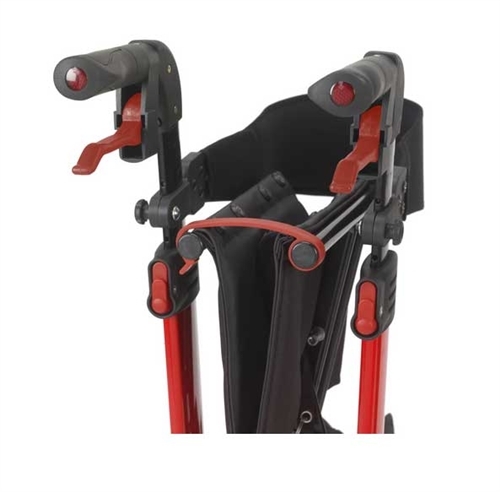 The cross-brace design allows for side-to-side folding and added stability. The frame is made of durable and lightweight aluminum.